In 1962, his first book Aspects of the Crusades was published. 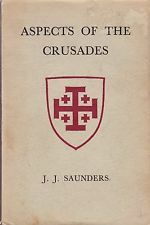 It is a unique collection of essays dealing with the Crusades. With the permission of Canterbury University Press, we are able to republish one of these articles. This entry was posted in Articles and tagged Crusades, Egypt. Bookmark the permalink.